We were all in the same position – head and shoulders on the white paper table cloth that my friend and I had purchased at the Shop N’ Save, along with sandwiches, our knees bent, wearing our eclipse glasses and watching the discs in the sky. We had traveled to be in the path of totality and had all wound up at Jokerest Memorial Park in Festus, Missouri. I had come with a friend. The family with whom we shared our make shift blanket had come from Evanston. The five of us, along with the hundred or so people in the park, watched together as the moon slid in front of the sun. 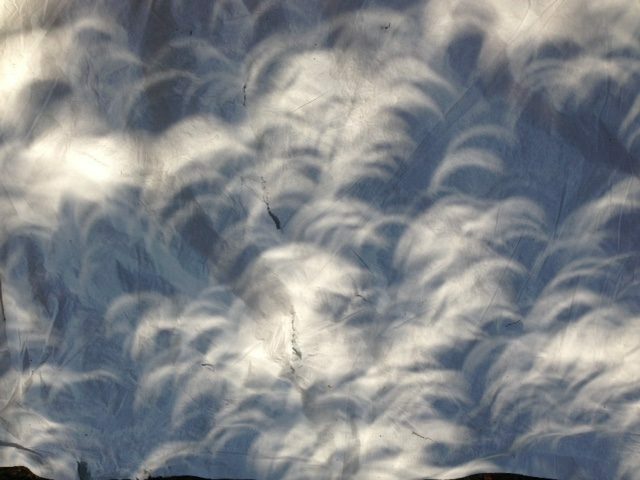 We pointed out to one another the changing shadows as the sun shone crescents through the leaves. We remarked at how bright the day was with only a sliver of the sun, and yet how different the light was – subdued somehow. Someone pointed out the pink and gold tones along the horizon all around us; we were surrounded by sunset. We noted the change in temperature and exclaimed when the cicadas began to hum. And then, with our heads and our shoulders on the white paper tablecloth and our faces pointed toward the sky together we took in one breath as the moon clicked in place in front of the sun to be rimmed with a silver halo. We all applauded. My eyes filled with tears. I knew, as I lay on that white paper tablecloth with a friend and with strangers, that we were on a planet spinning through space together, mere specs in the solar system which we did not create and cannot control, united by our common humanity. I’m very glad that you got to be a part of something that was so special to you!